As I’ve mentioned previously, my son M. has autism. I’m in Holland instead of Italy, and life is definitely interesting here. One of M.’s challenges with living in our world concerns his sensory processing. Here’s my parental, non-medically trained, limited knowledge on the subject: With typical people, when we invoke our senses by seeing, hearing, touching, smelling, or tasting something, our brains know how to handle that information and send messages to our nervous system to respond appropriately. This is called “sensory integration.” However, in people like my little M., these sensory signals get “jammed” en route to the nervous system and the brain doesn’t receive or process the information correctly. This is called “sensory processing disorder.” You can read more about it at the SPD Foundation website. The first time we noticed signs of SPD in M. was when he started walking in circles and wiggling his fingers in front of his face. Referred to as “stimming,” the movement of his fingers creates extra visual input for M. Likewise, while we travel on the highway, M. prefers to look out the side window of the car. Have you ever tried this? I did so to see what he was seeing and found it intolerable. My eyes couldn’t adjust to the blur and my head started to hurt. But for M., this extra visual stimulation feels right. M. also prefers to be moving. After our ottoman took a beating, we bought him a trampoline, currently stationed in front of the television so that he can jump and watch at the same time. Again, impossible for us typicals, but settling for M. His therapists and teachers find that M. is better able to handle quiet seat work after he’s done some vigorous gross motor activities. Interestingly, however, while M. is what they call “sensory seeking” in the visual and motor areas, he is “sensory avoiding” when it comes to auditory input. He often covers his ears while in crowded, noisy places. At bounce parties, where kids jump on giant, colorful, air-filled apparatuses, M. jumps like a mad man, but covers his ears at the same time due to the large blowers and squealing kids. He’s become adept at climbing around these giant contraptions without the use of his hands. Lately, M.’s new favorite sensory activity is ripping. Everything he can possibly get his hands on. Something about the feel of the paper, hearing the soothing noise of ripping, then playing with the pile of debris really calms him down. Yep. That’s M. sitting on the table, playing with his ripped up whatever it was. This is a common sight in my house. He loves ripping magazines, napkins, fabric softener sheets, phone books, anything within reach that’s tearable. Usually, this activity doesn’t bother me. It actually comes in handy with junk mail–no shredder needed. However, once in awhile things go bad. For example, since the Universe decided that my two children should be polar opposites, my nine-year-old, JC, loves to draw. He’s always on the lookout for paper, pencils, notepads. He’s written books, created masterpieces, painted landscapes with watercolors. He loves and respects paper. Do you see where this is going? When I hear that sound and then JC start to cry, I cringe. How do I explain to JC that his brother can’t help himself? As much as we try to avoid this scenario, the fact of the matter is that M. has quick hands. 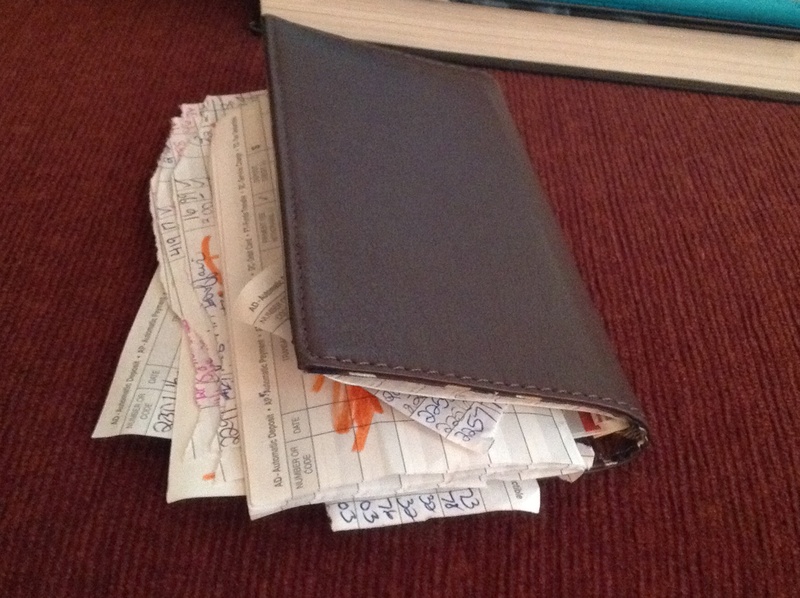 My checkbook. M. the Ripper strikes again, this time with an orange marker bonus. In a matter of minutes, he ripped every page out of the checkbook and colored it orange. He tried to write a check out to himself too, which I have to admit was kind of cute (I saved it). Nonetheless, I could have used that check registry for tax filing purposes. Oh well. 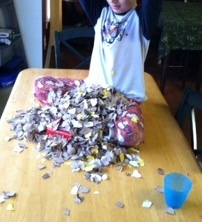 M.’s sensory challenges are currently being addressed in occupational therapy and at home. “Sensory diets” created by therapists especially for M.’s needs list activities we can do at home, such as jumping and various rough-housing type fun (I draw the line at shaving cream play. Way too messy!). He has a special, extra-tight SPIO vest, which we refer to as his “Superman vest,” that he sometimes wears velcro’d around his body to give him extra input. In the past, we’ve also used sensory brushes to “brush” M. There’s a method to the madness– a certain technique that we were taught by an occupational therapist. The theory is, that done correctly, the brushing provides sensory stimulation and positively affects the joints. 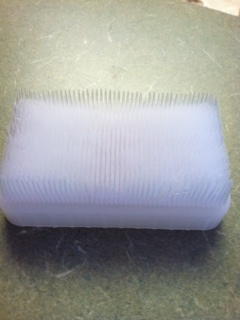 This is what our brush looks like. It’s made of soft plastic and doesn’t hurt. Back to the ripping, we’re hoping this phase calms down before he gets his hands on the winning lottery ticket (In case you’re wondering, it hasn’t been purchased yet.). Until then, we will accept donations of any junk mail you need shredded. This is absolutely lovely. My best friend has a brother who is autistic. It’s great to see your ‘non-scientific’ explanation of the things he does, and your deep patience and understanding is total awesomesauce! Thanks for the comment and the nice words (as well as your use of awesomesauce!). We’ve just started using a sensory brush with our daughter. She’s two, and having a lot of trouble at school with biting. Often the sensory system isn’t quite right in premies, so the OT thinks this may help Sweetpea. The daycare she is at now is wonderful, so I think the environment there is comfortable for her. However, the last daycare she was at may have created part of the problem. She did not walk until she was almost two, and it caused a lot of tension between us and the daycare. They complained she couldn’t keep up with the other toddlers, and she was excluded from certain activities. She became a second-class citizen and was ignored. To get attention, she started biting everyone – kids, teachers, her own parents. It was sad and frustrating. She’s so sweet and outgoing, but I think she’s biting kids in her class to say hi. If the sensory therapy doesn’t help, we may have to wait until she finds her words so she can be better understood. Loved your take on M’s passion for ripping. You are an amazing super mum. I have an eight year old son with autism, who use to do this too, maybe not with the same gusto. Once we understood the why, we had a deeper grasp on his needs. Discovering anxiety and SPD play a huge part in his world every day. Im sure like us, its one day at a time for you, giving thanks for the precious moments when they teach us how to think outside our own little predictable boxes. Thanks for sharing your heart with us. Thanks for reading and sharing. Yes, one day at a time. We always try to show patience and love, but as you must know, sometimes patience runs thin! We find too that the more we understand the easier it is. We are like, “Ooooohhhhhh! That’s what that is!” Good luck to you. Thank you for sharing this. I have no idea what challenges I will face as a parent, but hearing/reading about your parenting challenges helps envision proper responses to things I will face. Plus you seemed to handle Ms ripping with a lot of love and patience. Hopefully you won’t face these challenges, but know that if you do, it’s not the end of the world! Good luck to you as you begin your parenting journey! He’s a treasure and so is his mommie! Awesomesauce post! I was born in Holland, so I know what you mean by ‘interesting’. The post is absolutely lovely and thanks for sharing this part of your world with us. I love the ripping though. There is something cool about it, but it certainly changes the way you put things up around the house, I’m sure. Autism is a poorly understood condition. I wish you the best in your journey. Thank you for your comment and well wishes! It certainly is interesting, and messy 🙂 ripping isn’t the worst phase he’s been through. He used to like to spit. It was gross. We had to end that phase with more aggressive tactics! You and M make a wonderful team. This was a beautiful tribute to him. What a special little guy. He is very loved, we can all tell! I had to laugh, in nervous situations, I tend to shred my napkin! It’s nice to know that it was to help soothe me! Ha! I rub my earlobe. Whatever works! Wow I have to say the checkbook part was my “Favorite.” Your little M can really show life’s fun side. Thanks for sharing. It is surprisingly fun. It’s not all work. M. really has so much love in him and is such a pleasant kid. He’s just a little weird :). You are one of his favorite huggers too! Thanks for sharing this story about M. Your love, patience and humor rings thru the post and I can feel your smile in your words. Lovely! Thank you! I look forward to reading your blog.